Diamond drilling is work that requires precision, also in respect to the environment. Whether it is a case of designing KATI rigs, drilling conducted in the field, field research or core samples delivered to the customer, we take the environment into consideration in every way possible. We train all our employees, tidy drilling sites and use biodegradable hydraulic oils when performing our tasks. We sort our waste, transport fuels with the utmost care, and recycle whatever we can. 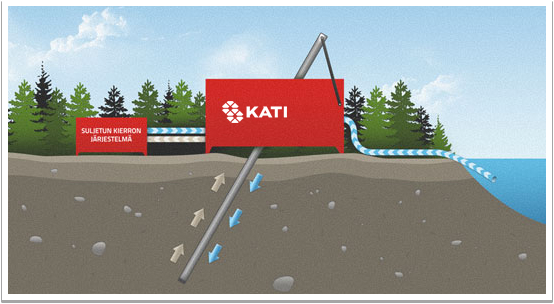 The KATI rigs have naturally been designed to leave as few traces as possible in the environment. In addition, we are constantly creating and developing new methods that are even more eco-friendly. For a number of years we have used the closed circuit system we ourselves developed, a system that brings eco-friendliness to a whole new level. This award-winning system can help the granting of an ore exploration permit in very sensitive areas. The water consumption of the closed circuit system is significantly reduced by recycling and the solids separated from the drilling water can be packed up and removed from the site. We see quality as sticking to agreed schedules, implementation of task goals in accordance with the customer’s instructions, consideration for worksite specific risks, and the uniform quality of work performance. We make assurances that our drill rigs are in excellent condition and core samples are clean. We also guarantee quality by 24/7 supervision and effective communication of any deviations occurring at the site. Our company’s mission is to provide drilling and measurement services with a broad selection of services quickly, reliably, safely, in an eco-friendly manner and by listening to the customer’s requirements. The core samples or data pertaining to the soil and bedrock we deliver our customers is representative, provides a truthful understanding of the conditions from which the sample or data has been acquired. We offer a quality guarantee, which ensures customer satisfaction and loyal customers. We build our drill rigs ourselves, which enables us to influence the principles we feel are important, such as eco-friendliness and occupational health and safety. in particular, we aim to identify all potential risks, minimise these risk and improve work ergonomics. Working in this way we will cause as little harm to the environment, terrain, flora and waterways as possible. For implementing our company’s goals, we are committed to continual improvement, e.g. Our management system complies with the regulations of ISO 9001:2015 and ISO 14001:2015 that were certified by DNV GL.